The Hurley Phantom Shorts have you covered, whether you intend to get wet or not. Its stretchy, quick-drying fabric provides flexibility where you need it. Quick-drying and stretchy Phantom fabric provides comfort and mobility. 20" (51cm approx.) length helps you move freely. Extremely disappointed. 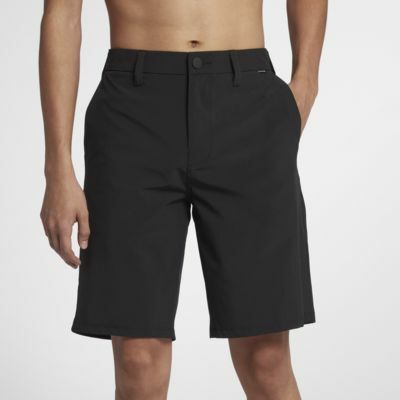 I really wanted to like these shorts and they seemed to be everything I was looking for in terms of fit, color and weight, but the material is not very durable. First time wearing them to play a round of golf and they already have a hole in them. I’ve never put a hole in any of my other shorts playing golf, so I don’t know if this pair was defective or if the material is just too flimsy. If you're trying to be a ninja pass on these shorts. Corduroy pants have some competition with the noise these bad boys produce. Comfortable but the material has changed from past versions of these shorts. Phantom label peeled off after two washes.